My rickety air conditioner is set to 78 today, but it’s creaking and wheezing just to get down to 84. It’s 95 degrees out at the moment, going up to 98 today in New York. Who knows what the heat index is. But one marketer that doesn’t mind the sticky misery is Paramount. 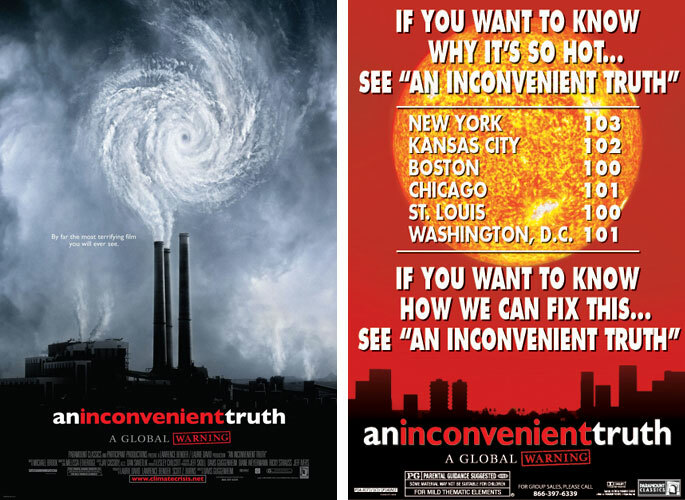 As you can see, the studio has rolled out a new poster for An Inconvenient Truth that’s timed to the nationwide heat wave. The new poster mirrors the original, with the swirling smoke becoming a sizzling yellow sun, baking a city skyline. It turns out that freakishly hot weather is good for something, at least. Thanks to Chris over at Movie Marketing Madness for tracking down the artwork.